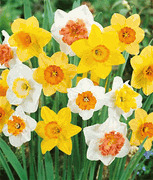 Classic form and fresh spring color make these large-cupped daffodils great for beds and borders, for naturalizing in woodland settings, for cut-flower bouquets and forcing for indoor enjoyment. Our special mix contains a full spectrum of colors, from snowy white to scintillating shades of yellow, orange, salmon, red and pink … even bicolors. Each variety also displays a prominent cup the center of the bloom. Large flowers are carried on sturdy stems that range from 12-24” high. Our premium bulbs are guaranteed to spread cheer to your spring garden.